I was raised on a 55-acre farm in a very tiny country town in Indiana. We had 3 horses named Tepper, Star and Chance, a few pigs and cows, lots of chickens, an unruly Rooster named Henry, a couple of dogs named Missy and Mac, and seventeen cats. I had a very lovely childhood and I wouldn’t change it for anything. I loved all our animals, I loved going for walks in the woods, I loved gathering eggs, I loved playing games with the dogs and cuddling the kittens, I loved meandering through cornfields and never being afraid of getting lost, I loved walking down the gravel road past sunset and smelling the cornfields, I loved watching and catching fireflies, I loved riding my bicycle, I loved the sound of the bugs at night, I loved the occasional fright of hearing the coyotes nearby, I loved riding on dad’s tractor, I loved going mushroom-hunting. Most of these things, my children will never experience. I feel a little sadness for that because I just know they would love that carefree feeling of being raised on a farm in the middle of nowhere and just feeling like the world is yours, you own it and you can do anything you want. I absolutely love where I came from and I would live my childhood over and over again a million times if I could. Speaking of childhood brings me to these cupcakes I made yesterday. These little chocolate cakes are piled high with the fluffiest marshmallow frosting and then dipped in chocolate. They are the cupcakes of many kids’ dreams. 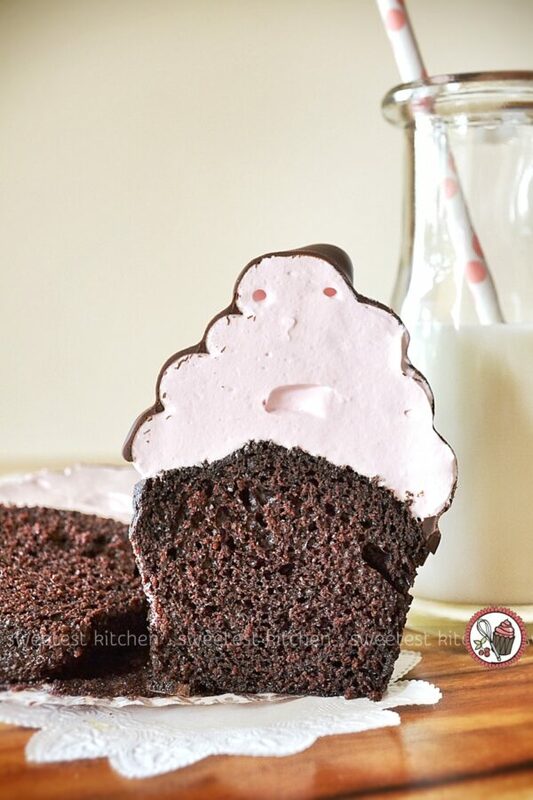 The classic hi hat cupcake, with pomegranate marshmallow frosting. Plus a couple of air bubbles in the chocolate coating (pictured dead center above!). Why did I photograph such a blemish? Why didn’t I even try to photoshop it out? First of all, that cupcake at the front and center had the best-shaped hi hat, so I had to feature it. I then tried to photoshop the air bubbles out, then wondered what I was doing. When did I become such a perfectionist that I had to photoshop out a couple of silly air bubbles? Just leave them there, Jamieanne! And so, I did. Let it be a note to you, though, to try to remove the air bubbles in the wet chocolate coating before it sets (just poke at the bubbles lightly with a toothpick, which I did do on some, but obviously not on the best one of the bunch!). Anyway. Believe it or not, out of the hundreds of batches of cupcakes I’ve made in my life, I have never, ever made hi hat cupcakes. But the other day I finally decided to give it a go. I made the chocolate cupcakes from Martha Stewart’s one-bowl chocolate cupcakes recipe, only I replaced the warm water with warm strong-brewed coffee, used a combo of whole milk + vinegar to replace the buttermilk, and used grapeseed oil instead of safflower oil. Then, I got stumped on the frosting. 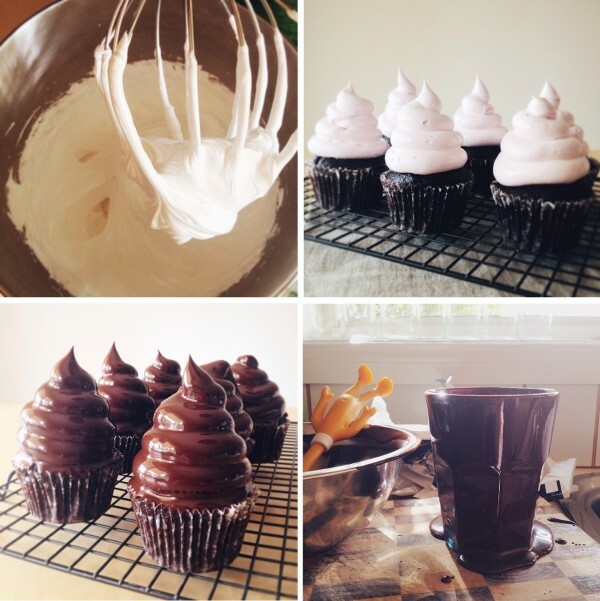 Most marshmallow frosting recipes for hi hat cupcakes involved using a handheld mixer over a pan of simmering water. That’s all well and good, if you have a handheld mixer. So I just did a little bit more browsing and came across this one from Brown-Eyed Baker. This recipe said to whisk (by hand) the egg white/sugar mixture over simmering water until the sugar was melted, then transfer the mixture to a stand mixer and beat until it was thick, glossy and marshmallowy. Okay, well, I don’t even have a thermometer either, which this recipe said to use, but instead I just dipped in my fingers from time to time and rubbed the mixture together between my fingers to make sure it was smooth and no sugar bits remained. Easy. Then, I beat the living daylights out of the mixture and ended up with a beautiful bowl of marshmallow frosting. But I couldn’t stop there. I wanted to flavor the frosting for a little twist. I wanted to use pomegranate juice, but I was afraid I’d need to use too much of the juice for a good flavoring and all of the liquid might ruin the consistency of the frosting. Instead, I used pomegranate molasses (3-4 teaspoons), which is essentially a really thick syrupy liquid made by reducing pomegranate juice and sugar. I also used a little bit of vanilla. To get the light pink frosting, reminiscent of the color that might have came through had I used plain pomegranate juice, I used a couple drops of soft pink food coloring gel. Piping on the frosting was so fun! I have never, ever, piled frosting so high on cupcakes before. Oddly enough, my very first attempt at making the swirly frosting was the best out of the entire batch. This is the cupcake that ended up with the air bubbles. As with most first-time hi-hatters, I was so nervous about dipping the cupcakes in melted chocolate. How on Earth would the frosting not just come off? In the last photo above, you’ll see a cup coated in chocolate. This was my dipping cup. I didn’t use the best cupcake for my first dip. I used the worst one. And, much to my surprise, the frosting did not fall off. Although, I had to kind of swirl the cupcake around because the frosting got a little wobbly and instead of falling off, I was afraid it would slide off. It did not, however, and I sat each cupcake back on the wire rack, as you see in the third photo above. How gorgeous do those glossy cupcakes look! I placed the cupcakes in the refrigerator to set and began the cleanup process (there was a lot of chocolate smeared around the kitchen!). Once the chocolate had set, it wasn’t so glossy anymore, but instead a bit on the matte side. However, they were still quite impressive and gorgeous and I couldn’t wait to photograph them. But better yet, I couldn’t wait to cut one in half! Wow, yeah, that’s really looking good! Um, wait… is that a face in the frosting? I guess it is. I didn’t even notice this until a friend of mine pointed it out. She didn’t know if the face was intentional or accidental. It was entirely accidental. I can’t believe I didn’t even notice it before. I only wish the face looked a little more like it was smiling, as it sort of looks a little horrified! Anyway, as you can see, the cupcakes turned out brilliantly and they were so much easier than I imagined. Everything about them (except for the horrified face) is so fun that I’m pretty sure I would make these again for a special occasion. Yeah, there’s a bit too much frosting, and yeah, they’re probably a bit over-the-top, but come on, who doesn’t want a little throwback to childhood every now and then!? 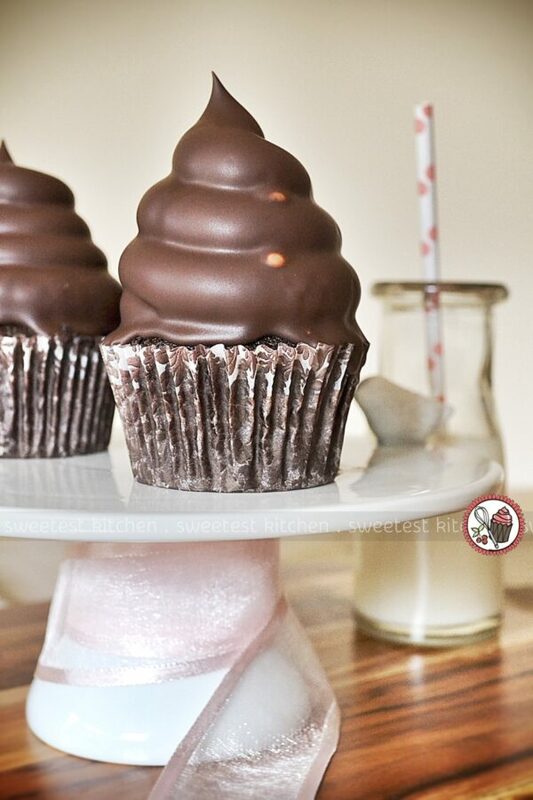 These impressive hi hat cupcakes are a little ode to childhood with chocolate cake and pomegranate-flavored marshmallow frosting dipped in pure chocolate. Sift together cocoa powder, flour, sugar, baking soda, baking powder, and salt into a large bowl. Add eggs, warm water, buttermilk, oil, and vanilla, and mix until smooth, about 3 minutes. Scrape down the sides and bottom of bowl to assure batter is well mixed. In the bowl of an electric mixer, whisk together the sugar, egg whites, water and cream of tartar. Set the bowl over a pan of barely simmering water and whisk until sugar is dissolved and the mixture reaches 160F F on an instant-read thermometer (or simply dip your fingers in and rub together to make sure the mixture is smooth and you can't feel any sugar). Transfer the bowl to a stand mixer fitted with a whisk attachment and beat on high speed until the frosting forms stiff peaks, about 12 to 16 minutes. Add the vanilla extract, pomegranate molasses (if using) and food coloring (if using) and beat until combined. Transfer the frosting to a large pastry bag fitted with a ½-inch round decorating tip. Pipe a high swirl of frosting onto the top of each cupcake. 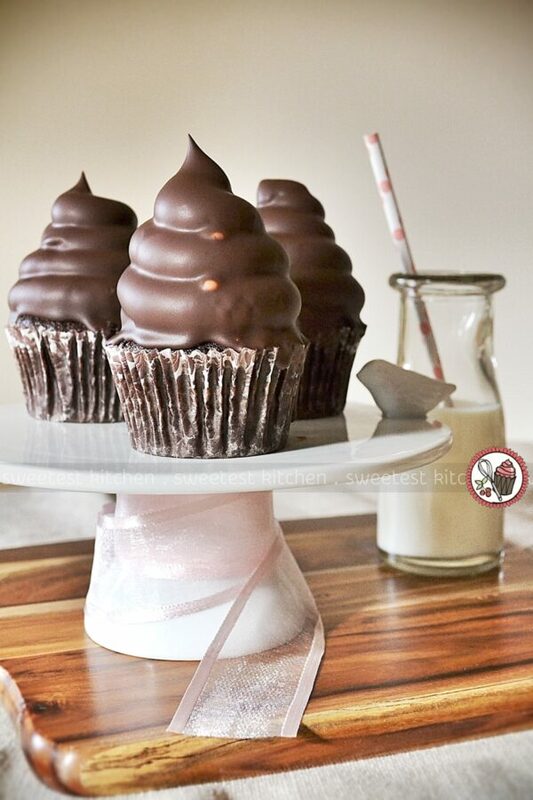 Transfer the cupcakes to a wire rack and refrigerate while preparing the chocolate coating. Combine the chocolate and oil in a heat-proof bowl set over a saucepan of barely simmering water and stir until melted and smooth. Transfer to a small, deep bowl, and cool to room temperature. 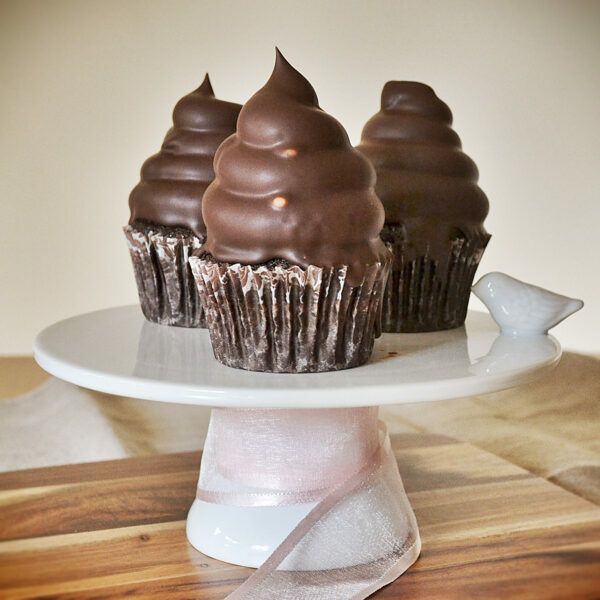 Holding each cupcake by its bottom, quickly dip each cupcake into the chocolate to coat the frosting, and place on a wire rack. Let the cupcakes stand at room temperature 15 minutes, then refrigerate for 30 minutes uncovered. Place in a covered container and refrigerate 2 additional hours before serving. Cupcakes can be refrigerated for up to 3 days. -I only frosted 6 cupcakes from my batch of 12. I used almost all of the frosting for these 6 cupcakes because I wanted a really high, impressive peak. Keep in mind that if you want a really high peak on all 12 of your cupcakes, you may need to double your batch of frosting. -You will have quite a bit of leftover melted chocolate, but this is necessary as you need to have a lot to easily dip the cupcakes. Save the remaining chocolate in the refrigerator for other uses, as it can be gently be remelted. -If you don't want pomegranate-flavored frosting, just leave it out for good old plain vanilla. 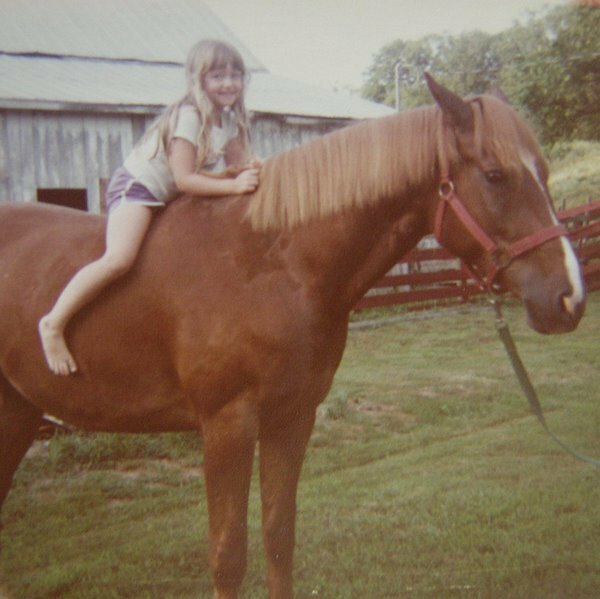 I am so jealous that you grew up with horses! I’ve always wanted to ride a horse so that’s something I need to organise to do sometime! Growing up on a farm would have been awesome – and I bet you know so so so many things that others don’t. these are so cute and look like fun to eat! These look absolutely fantastic – they look like the work of my favorite local bakery, which specializes in cupcakes. AMAZING!! I’ll have to give these a try! Hi Rhonda, I’m sorry you had trouble with the ganache. I have no idea why it would slide off! I was going to say perhaps you could have accidentally added too much oil to the chocolate, but since you say it was too thick at room temperature then that probably wasn’t the case. You had the right idea to freeze the cupcakes before dipping. I’m glad they still turned out tasty, though!